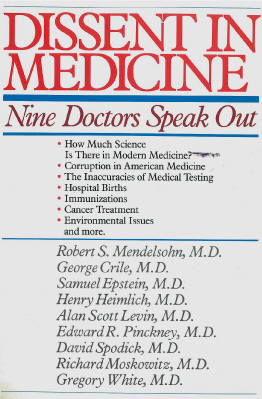 In 1984, Dr. Mendelsohn convened a meeting of nine eminent physicians to discuss areas in which they rejected current medical and surgical standards of practice. Besides Dr. Mendelsohn, the dissenters were George Crile, M.D., Samuel Epstein, M.D., Henry Heimlich, M.D., Alan Scott Levin, M.D., Edward R. Pinckney, M.D., David Spodick, M.D., Richard Moskowitz, M.D., and Gregory White, M.D. Dr. Mendelsohn published the proceedings of this meeting in 1985 in Dissent in Medicine, his last book. Dr. Henry Heimlich, developer of the life-saving Heimlich Maneuver, criticizes the American Red Cross techniques for the treatment of choking, drowning, and resuscitation. After the publicity generated from the Dissent in Medicine conference, the American Red Cross revised its guidelines. Other experts in the book point out the risks of medical testing, discuss environmental hazards to health, reveal instances of corruption in modern medicine, and report that obstetricians underestimate the harm caused to childbirth by hospitalization.